I went over to my parents for a couple of days earlier this week. I took Monty and my sister took her dog and because hers and mum’s dog are both small they had a bath. 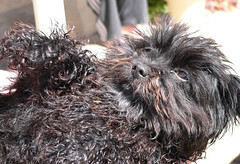 This is Connie, mum’s dog after her bath. Mum is holding her and she’s so posing for me. Click on the photo and see the others.